Preheat the oven to 375°F. 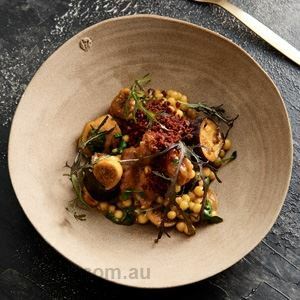 In a small bowl, whisk together all the ingredients for the honey harissa dressing. Add 1/4 cup of the dressing with the sweet potatoes and spread out onto a lined baking sheet. Add another 2 tablespoons of the dressing with the chickpeas and spread out onto another lined baking sheet. Place both baking sheets in the oven and roast for 35 to 40 minutes, until the sweet potatoes are tender. In a small pot, bring the beluga lentils and 4 cups cold water to a simmer. Cook for 20 to 25 minutes, until the lentils are tender. 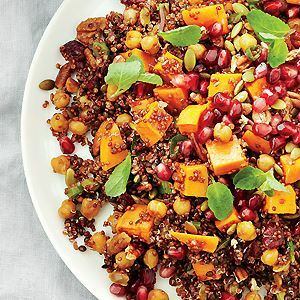 Drain, rinse and place in a large bowl, along with the roasted sweet potatoes and chickpeas. Meanwhile, in another small pot, bring the red quinoa and 4 cups water to a boil; reduce the heat and simmer for 12 minutes. Drain the quinoa and let dry in the sieve for 2 minutes. Add to the sweet potato mixture. Stir in the green onions, pumpkin seeds, pecans, mint and cranberries. Drizzle with the remaining dressing and gently combine. Place the warm salad on a large serving platter and garnish with the fresh pomegranate seeds and mint leaves. with sweet potato, red quinoa and chickpea ft honey harissa dressing. 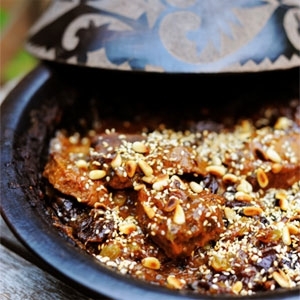 The shape of the tagine lid allows the dish to maintain its moisture and heat.